I know, I know. We're totally "on" with the Christmas books, aren't we? Actually, I've decided to make this entire week about Christmas books. So stay tuned because each review boasts a giveaway! 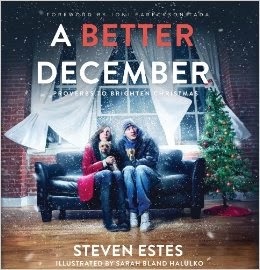 I was asked if I'd like to review a copy of A Better December and I said yes because it is written by Steven Estes (who helped co-write Joni Eareckson Tada's book and who has been a long time friend of hers). I've never read a book written solely by him and was curious. Coupled with the fact that this book focuses on reading Proverbs and applying the wisdom found therein specifically to the Christmas season, well, it sounded promising. A Better December is really more like a gift book than anything else. It is probably meant to be read as a devotional, in short bits and chomps, but it's such an easy read that I breezed right through it. This book is not divided up into chapters, but rather into topics. Estes offers a verse or insight from Proverbs and seeks to apply it to topics such as contentment, gift-giving, children, longings that we have over the holidays, and changes. There is likely on average about 4 paragraphs of text per topic, although the text is laid out in a manner that you would find in a gift book and again, is not like that of your typical devotional. It is a brief and pointed read. December is a crazy busy time of the year for most of us. I know that most people are always eager to find encouragement to slow down and to stop striving for perfection. Most of us want to be able to take a low-key approach to the holidays and spend time reveling in the things that really do matter - namely, relationships. Also, due to oppressive time constraints, many of us are looking for quick bursts of inspiration which help us to slow further down and maintain a relationship with our Savior during this Month of Crazy (Fun). If you are looking for a short devotional that will help keep your heart focused on the right place, you might be interested in this title. I can't say I was overwhelmed by it but neither was I underwhelmed. It is good to read Proverbs year round and apply it always. Estes takes us another step forward in applying this Book of Wisdom to our Christmas holidays. I've no objection to that. For more information about this book, see the New Growth page for A Better December. Would you care to win a copy? New Growth Press has generously offered to give away one copy to one of my readers here at Reading to Know. If you are interested in being entered into the drawing, simply leave a comment below including a valid e-mail address. This contest is open to U.S. Residents only and will be open through Wednesday, November 27th. THIS CONTEST IS NOW CLOSED. THE WINNER (as selected by random.org) IS #5 - Katie S. CONGRATULATIONS! My thanks to New Growth Press who sent a copy of this book my direction in order to facilitate this review. I received no additional compensation for this post and, as always, all opinions are 100% my very own! I'd enjoy reading this book! Excited to read this as it will help us focus on our Lord Jesus Christ. What a great read for December. I would love to win. I have heard about this book and really want to read it. Me too please! I would love to enter to win this book too. I have always been impressed with the life of Steve Estes because of the impact he had on Joni Eareckson Tada, so receiving this book that he wrote would be wonderful! thanks for the chance to read this Christmas story. I, too, have followed Joni's life story.